It’s no secret that I’m a Pinterest-aholic. I love it. It’s like every good idea that’s on the internet all smashed into one place. Who wouldn’t love that?? 10. How to Apply Nail Polish – This is one that you would think would be a no-brainer, but it is a fabulous way to get your nail polish right every time! It’s attached to a great website for finding nail tips too. 9. Homemade Mod Podge – When I was making some of the things for Emma Ramey’s nursery, I needed Mod Podge – but that stuff is expensive for just being glue. So I found this, and it worked great! My only complaint is that it smells a little vinegary, but not a big deal – it can be covered up. 8. Activities for Infants to Toddlers – I don’t know about you, but I have those days where I can’t think of a thing to do but sit and watch TV…which I try to limit. This website has hundreds of activities that are divided in ages from birth all the way up through toddlers and small children. It also tells you the developmental advantages of each activity. Awesome! 7. Red Velvet Cheese Ball – I made this for a faculty meeting one day when I was still teaching, and it was a hit. I had so many people ask me for the recipe. It was really easy to make too! 6. Repurposed Lysol Container – I use this to hold grocery bags to use as mini trash bags around the house. I love this idea! It even shows you how to roll the grocery bags to fit in there so they’ll dispense. 5. Baking Soda Facial – This one is actually by my blog friend Jenna – it is super easy and will exfoliate your face like no product I’ve ever found! Be careful though – it’s easy to “over-exfoliate” with this, especially around your nose and chin. But it works! 4. Dream Home – Obviously I haven’t done this one, I just love love love this house. 🙂 You can see my other dream house ideas here. 3. At-Home Gel Nails – So, so easy to do…you really just put a coat of a gel product under your base coat, put your polish on, and put on a top coat! This girl that usually can’t wear nail polish for more than a few days is on a week and counting with very few chips. Not very expensive either…all of the polish was about the price of getting 1 gel manicure! 2. Nutella Cookies – These are TO DIE FOR, and so easy. My husband who hates chocolate liked these. They just have 3 ingredients – Nutella, flour, and eggs! The recipe calls for sugar too, but like a previous pinner, I agree with leaving out the sugar in the recipe. Instead, I dipped the cookies in sugar for a coat on top – yum! 1. SOS Mix – This has been SUCH a life-saver. I’m trying to use less processed food as much as possible. This replaces canned soup in recipes – it’s less processed, cheaper (than even buying the cans with coupons), and easier to store! I made about 30 cans worth of soup for around $20. I quadrupled the recipe on this site and it still fit in a gallon ziploc bag. Such an awesome idea! One hint though – when I mix it with water for a recipe, I do 2 parts mix, 1 part water. A little different than what this calls for, but it makes it thicker (like the condensed soup). 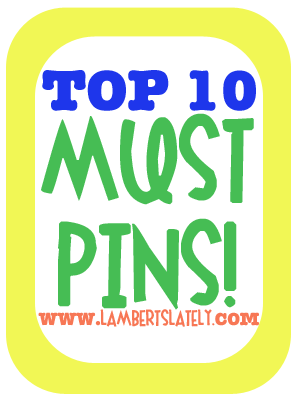 What are your favorite pins?